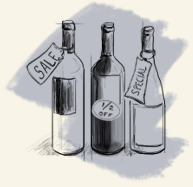 The Sec Wines Newsletter features wines that we're really excited to offer you. These are wines worthy of a special feature due to their high quality to value ratio and just plain deliciousness. Enjoy! Each sampler case consist of four bottles each of 2005, 2010 and 2014 while the sampler 6-pack consists of two bottles of each vintage. First, if you’re unfamiliar with Muscadet, (it sounds like a number of other types of wine) Muscadets are white wines made from the grape variety Mellon de Bourgogne and are always completely dry. I’ve always loved great Muscadet and have been cellaring for them for years (my oldest remaining bottles are from the 2002 vintage). Recently, I’ve had the privilege of drinking a number of Muscadets with over a decade of age on them - all of them fresh, vibrant, complex and intensely terroir-driven. I wish I could say the same for a lot of expensive White Burgundies from the same timeframe that are spoiled by pre-oxidation. Family owned since the 15th century (how did they escape the guillotine? ), the House of Chéreau Carré occupies the most privileged position in the Loire-Atlantique department of France. Chéreau Carré issues a few bottlings of Mucadet with the Comte Leloup de Chasseloir being the most intense and age-worthy. This three hectare site is composed of 100+ year-old vines growing in slate soils on a plateau that overlooks the river. All that to say, these three wines are stunning. All three vintages are “classics” and are wonderful to drink now, and all will continue to cellar gracefully for years to come, especially the great 2014. There is no greater value in dry, food-friendly, mineral-laden white wine than great Muscadet, and these are great Muscadets! Geek Alert: Yes! This is a wild, old-school red with a good dose of “Southern French funk.” Domaine Gauby’s Calcinaires Rouge is a blend of 18 - 90 year old Syrah, Mourvèdre, Grenache and Carignan vines grown on Limestone soil. While elements of the Syrah, Carignan and especially the Mourvèdre are clearly evident, this is really a wine of the land; an unspoiled, rustic region of France not far from Spanish Catalan. Aromatically, the Mourvèdre takes center stage with its typical earthy and downright barnyard-like profile - much like classic mature Bandol Rouge. The sturdy palate is surprisingly fresh and vibrant and perfectly balanced (13% Alc.) with floral tones reverberating around the blueberry fruit and gentle tannins. Enjoy now and over the next seven years with grilled lamb, sausages, ratatouille, and hearty stews and casseroles. Hold on! If you’re already a fan of great Loire Valley Cabernet Franc, then here you go -great producer, great vineyard, great vintage, great price. If you’re unfamiliar with Loire Cab Franc or have had your interest peaked by Washington or California Cab Francs and want to take the step to more complex and food-friendly wines, then here’s the ticket! With the 2016 vintage, Baudry’s Clos Guillot has ample rich cassis, plum and cherry fruit buttressed with notes of tobacco, pepper, firm tannins, good acidity and plenty of stoney minerality form the Clos Guillot’s limestone and clay soil. Enjoy now and over the next 15 years. Come on, you deserve it! How unfortunate for those who pass over this selection because they think Sake is not a beverage to be taken seriously. Great Sake, like this one, deserves to be placed alongside the world's other great beverages. Seventh generation brewery president and brewer Takaaki Yamauchi almost single-handedly brought back the use of the watari bune rice in Sake making. In 1988 Yamauchi was able to obtain 14 grams of freeze-dried watari bune from the Japanese government's Agricultural Research Center, its only known source at the time. From these 14 grams, Watari Bune "55" was created and has gone on to become a cult brand and Sake press favorite first in Japan, and now all over the world. The Watari Bune 55's complex aromas jump from the glass with notes of honeydew melon, lychee nuts and fresh flowers and leads to the expressive full-bodied palate with just the right balance between richness and crisp acidity. Enjoy lightly chilled with a wide range of foods like tempura prawns or vegetables, miso-marinated black cod, sushi, pork with soy-based sauces, and fried chicken - really!